In late 2011 I started to look at the background of my paternal grandmother, Annie Edith Puckridge. It has been a revelation to find that this gentle, home-loving person was an offspring of adventurous and ambitious families with colourful backgrounds about which we knew nothing. Sadly, looking at the female bloodlines is still mainly about the males, because they were out doing interesting or exciting things, while the women were at home, bearing children, cooking, cleaning and surviving as best they could, their way of life and opinions usually unrecorded. I am aiming to acknowledge the female grandparents. With the assistance of Mona Puckridge I obtained copies of the thoroughly researched Puckridge family history books written by her sister-in-law, Mollie Puckridge: Pursuit Through the Years-a Puckridge Family History and the update The Pursuit Ended-A Puckridge Family History which trace the Puckridges back to the 1730s with confidence. The following summary is based on Mollie's fine books. I have been able to add a few details to the family story via online resources. William Puckridge born 1-4-1716 who was a Freeman of the Joiners Guild, married Mary Hall on 1-1-1735/36 at St Benet Church, Paul's Wharf, London (at left). After 1756 Mary and William lived at Islington where Mary died on 24th October, 1770 aged 56 years. William died 16 years later in 1786 aged 70 while living with his son, Charles, at 11 East Harding St, Gough Square in the Parish of St Brides. 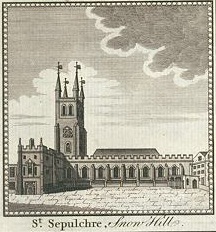 Both Mary and William were buried in the Church of St Sepulchre (at right). 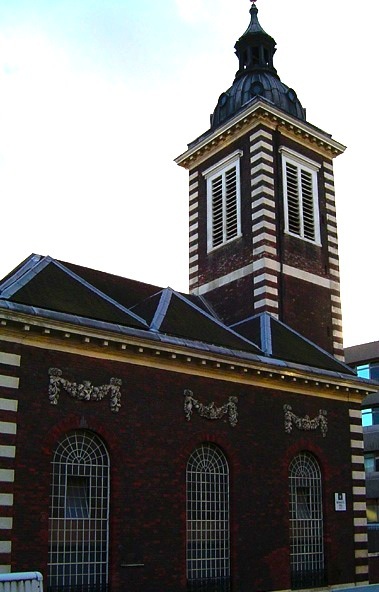 Mary Hall was christened	on 19 Jan 1714	at St Andrews, Holborn,	Camden. Her parents were Thomas and Elizabeth Hall. In 1790 she was living at 24 Hosier Lane, London with her husband who was described as a carver. Mary bore 12 children while at Hosier Lane, 7 boys and 5 girls, all baptised at the Church of the Holy Sepulchre, London. Five children died in infancy. 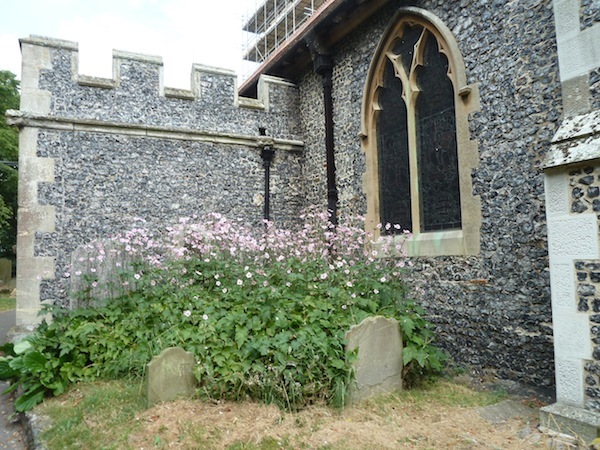 Thomas (1), Jane, Mary and Elizabeth and George died as infants and were buried at St Sepulchre. Her Uncle, was George Graham, a watchmaker and inventor. When he died he left her twenty guineas and a good portrait of himself (above), commissioned by the worshipful company of Clockmakers. 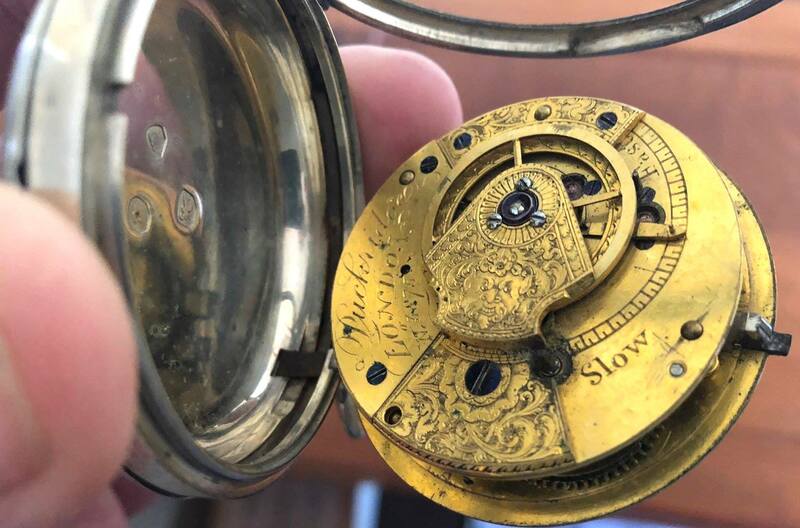 He died 16 Nov 1751 and is buried 'in the middle aisle, in his master Mr. Tompion's grave' at Westminster Abbey in recognition of his achievements in watch and instrument making. Mary had a close relationship with the childless Grahams, and was probably a Quaker herself, and it is likely that George Graham's influence led to 3 of her children, Thomas, Moses and Charles, being clock and watch makers. William was a 'tarner and gilder.' Mary married Joshua Penn but we don't know what happened to Polina and Elizabeth. The sixth child of William and Mary Puckridge, Thomas Puckridge, born 29-10-1741, died 24-4-1789, married Martha Mansfield, and they had 10 children, 4 sons and 6 daughters. Directories have Thomas Puckridge working at 73 Snow Hill, London, from 1790 to 1815 and at 2 Goldsmith Square from 1805. Thomas and Martha's second child, John Puckridge, was born 6 December, 1765. Thomas died on 24 April 1789 aged 47 but Martha lived to the age of 89. Both are buried at St Sepulchre, London. Martha Sophia Puckridge 17-1-1781 1802 m. W.T. Curtis. All the children were baptised at St Sepulchre apart from William. Polina and Thomas died young and are buried in the bay vault at St Sepulchre. Martha Mansfield Puckridge died at Snowhill aged 89 and was buried at St Sepulchre on 18-12-1826. 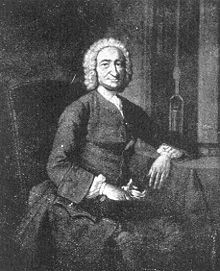 John Puckridge, 2nd child of Thomas and Martha, born 6-12-1765, also became a clock and watch maker. (At left is a photo of a fob watch made and signed by Henry Puckridge in 1837, with a picture of Puck in the middle, courtesy of Puckridge descendant, Bruce Sandeman-Craik) He was made "free" of the Clockmakers Company in 1788 and was a common councillor of the city of London. His premises were listed as 73 Snow Hill, London. John Puckridge and his wife, Elizabeth Wakeling, whom he married at St George in the East on 31-8-1800, after they had had five children, had 11 children in all, 7 reaching adulthood. 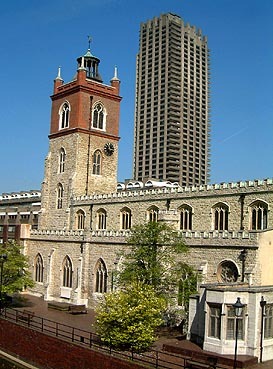 The children were mainly baptised at St Giles, Cripplegate (below right). They lived at Snowhill and then at Islington. Elizabeth died aged 42 years in 1812 but John ensured that all 7 children were educated and established in productive occupations. He later had a second family of three sons with Elizabeth Patience Gillett: John St George Puckridge born on April 23rd, 1819, "within the sound of Bow Bells," Septimus Puckridge and Percival Puckridge. John Puckridge is listed as freehold owner of 73 Snowhill in an 1838 electoral register. John St George was the only child christened at Christchurch, Greyfriars, on 7-6-1837, though born in 1819-the reason for the delay is unknown but John Puckridge senior seems to have been unconventional with respect to the usual religious ceremonies. Elizabeth Gillett died soon after the birth of Percival in 1827 and fearful for the future of his youngest sons, John made a will dividing all he possessed between the three youngest children. John is shown at left in a photo which appears in Pursuit Through The Years. On his death in 1840, this will was contested by an older son, but eventually John St George, the eldest of the second family of children, was granted administration of the will. 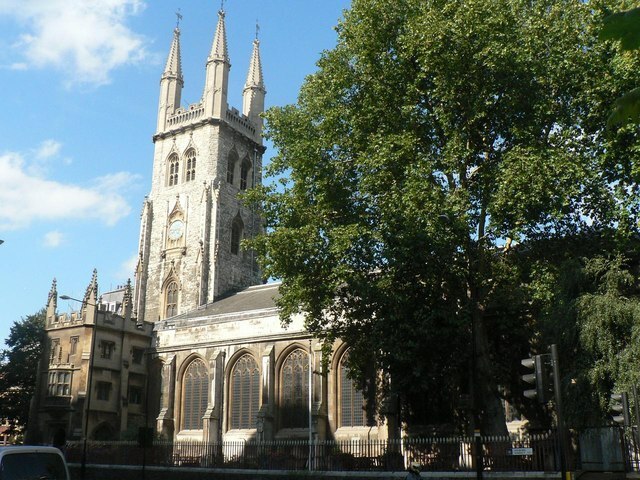 John was buried in St Sepulchre (pictured as it is now on right) on 11-1-1840. In the 1841 census, John Puckridge aged 20, Septimus 15 and Phillip (Percival?) Puckridge 14 are listed as occupants at Snow Hill. There was apparently animosity between the early family and the new one. Elizabeth died soon after the birth of Percival Graham, when she was 42 in August, 1830. John St George Puckridge was a clockmaker according to his marriage certificate, but Mollie Puckridge believes this description may be because he was 'winding up' his father's clockmaking business at the time, as on the birth certificates of his children he is described as a clerk, agent and traveller. He probably worked for a brewery belonging to the Woodwards, the family (more later) of his wife, Sarah Woodward, whom he married on 9-8-1840 at St John's, Islington. The growing Puckridge family lived in Putland St, Mile End and in Plaistow, West Ham, County of Essex and seem to have been reasonably prosperous, yet John and Sarah decided to emigrate to South Australia. It may have been because a daughter died, because John thought that a brewery was not a suitable place to bring up children or because reports from South Australia were glowing. Sarah's Uncle, Francis Bunn, was listed as the licensee of the Golden Fleece Inn, Currie St, in the SA Almanac of 1851 and of the Royal Exchange Hotel, Hindley St about the same time. Another relative was a grazier in the South East and a cousin had Tara Farm at Blakiston. Having made the decision to emigrate, Sarah and John and their 6 children, Catherine, Alfred, Anthony, Harry, Florence and Russell left Falmouth on the Lady Nugent on October 13th, 1853, arriving at Port Adelaide on January 21st, 1854. They were among the 34 cabin passengers on the ship, therefore not assisted passengers. John (at left) and the family started sharefarming at Blakiston (now part of Littlehampton about 36 km SE of Adelaide) but in June, 1854, their fourth child and third son, Harry, died aged 5 years. Another son, Horace, was born to them in 1855 at Mt Barker near Adelaide, South Australia. The share farming seems not to have been a success as from 1856 to 1861 John St George was licensee of the Buckingham Arms Hotel where two more sons, Walter Graham and Septimus Allan were added to the family. John St George was a tall and imposing man and a stickler for correctness, apparently. While managing the Hotel he was applying for property on the West Coast. 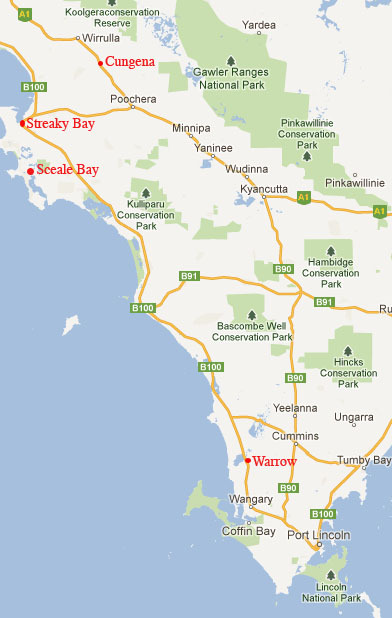 By 1862 the Puckridge family were at Lake Wangary on Eyre Peninsula, SA, 45 kms west of Port Lincoln. Their homestead overlooked Lake Wangary and was large and comfortable with a big garden, vegetable garden and orchard and John St George seems to have been a very capable and innovative farmer, though "peppery at times." On the death of John St George, the property was divided between the 3 surviving sons, Septimus Puckridge, Horace Puckridge and Russell Puckridge. 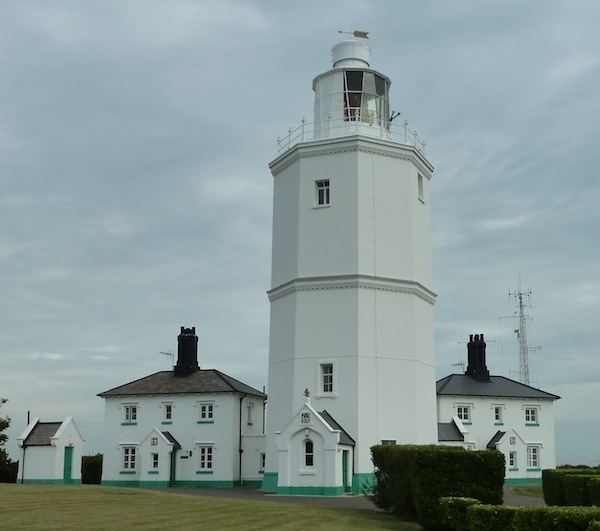 Thomas Hiller, (at left) the 3rd child of John and Esther Hiller, mariner, was born 11-4-1768 at North Foreland Lighthouses, Isle of Thanet, Kent and married Sarah Huggett born 22-2-1770 of neighbouring Stone Farm, Thanet Kent. They were apparently childhood sweethearts. At the end of his life, Thomas Hiller retired to an Almshouse in London at No 5 Trinity Green where he died in 1859. The house is shown in the wonderful blog, Spitalfields Life. Esther Jane Hiller 27-9-1804 - 9-12-1885. Three of the Hiller daughters married 3 Bunn brothers-Sarah married Henry Bunn and emigrated to Melbourne with her daughter in 1857; Millicent married Joseph Bunn who was licensee of "The City of London Hotel" and later "The Ship Inn" in Dover; Esther Jane married Francis Bunn and emigrated to Adelaide where they had hotels, the Golden Fleece Inn at the corner of Currie and Rosina Streets, Adelaide, and the Exchange Hotel in Hindley Street. Frances Elizabeth Wqoodward b. 1833. All the children were baptised at St Stephens, St Albans. 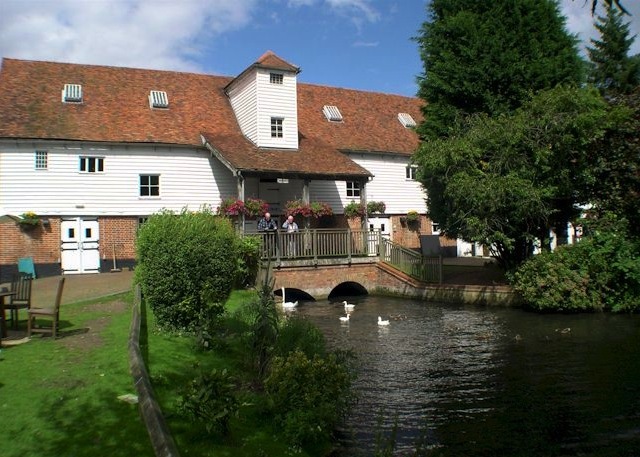 James Woodward was a miller at Moor Mill, St Albans (at left-now a restaurant). The mill was set in large grounds where the children had plenty of room to play. 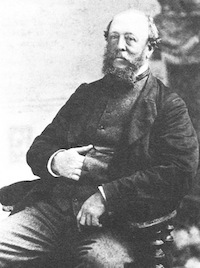 Between 1824 and 1827, James and Sarah Woodward and their seven children moved to London and James established a brewery. James Woodward died 7 May, 1844 aged 55 years. Susannah Woodward was listed in the 1841 census as aged 45, living with Joseph Bunn, Hotel Keeper and Katharine Bunn. In the 1851 census she is again listed as a widow, 58, living with daughter Barbara 33 and son in law George Johnston France aged 34, furniture dealer. In 1861 census she was living aged 69 with her daughter, Barbara, 43 and son-in-law George J. France 44, at 36 Piccadilly. Listed on 1871 census as living aged 79 with her daughter, Barbara, 53 and son-in-law George J. France 54, Fine Arts and Antique Dealer, at No 1, Lower Seymour Street, Marylebone. 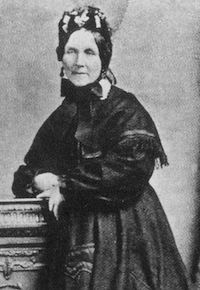 Susannah Woodward died aged 81 in 1872 at Marylebone, London. Sarah Frances Woodward (At left)was the 4th of 11 children, born 1815 to Susannah and James Wooward, St Albans, Hertfordshire. She was baptised September 10th, 1815, her father being recorded as a meal man or miller. James Woodward and all his siblings had been baptised at St Albans Abbey, where his parents, James Woodward and Mary Simpson, were also married. James Woodward and family had Moor Mill so Sarah would have grown up there, but around 1828 they left for London. Sarah married John St George Puckridge at St John's, Islington on 9th August, 1840, and at that time she belonged to the Parish of Holloway. Her father was already dead. Witnesses at the wedding were her sister, Barbara Baron Woodward and John's cousin, George Johnson France, whom Barbara later married. Sarah bore 8 children in England, but one baby, Blanche, died in bad circumstances. From 1856-1861 the family lived at Walkerville at the Buckingham Arms Hotel (still going strong, picture at right taken from Walkerville Sketchbook, drawings by Bill Walls, 1977) where John was licensee and sons Walter and Septimus were born. By 1862 the family was established at the Lake Homestead, Lake Wangary. It was built of sheoak and clay (pug and pine), and whitewashed with verandahs on 3 sides. Sarah was rather delicate but organised a lovely flower garden, helped educate the children and insisted on correct speech and deportment. Sarah and John had the sadness of seeing 5 of their 10 children, 7 sons and 3 daughters, die young. At various times she was nurse and teacher and social worker to all on and around the property. Eventually they retired to Seaview Cottage, Port Lincoln, Sarah dying 13-5-1895 aged 79 at Seaview Cottage on 11-5-1895, so John St George Puckridge lost his "Dolly" for 3 years before his own death on 10-9-1898. 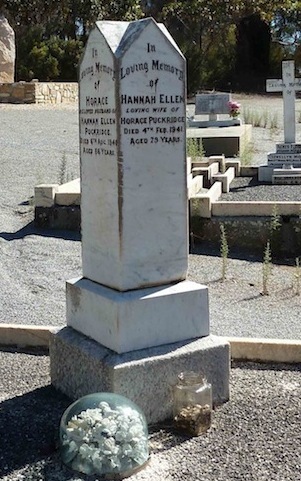 They were buried in the old pioneer cemetery at Happy Valley, Port Lincoln but apparently their graves were unmarked and the burial plans lost, which seems unbelievable given the prosperity they achieved in life. That means that 3 of our great, great grandparents have no gravestones despite their brave emigration and pioneering efforts in SA. Sarah and John are, however, remembered on a Wall of Unmarked Pioneer Graves at the Port Lincoln Pioneer Cemetery, pictures kindly sent by Karissa Ford of the Port Lincoln Council. Horace Puckridge, (left) the fifth son and seventh child of Sarah and John St George Puckridge, born 10-4-1855 at Mount Barker died 6-8-1940 at Coulta, SA, was the first Australian born child of the family. He grew to be tall and peppery too, and was known as The Major. He was a good mechanic and mason and a bit of a ladies' man. He began farming with his father. In 1884 he married Hannah Ellen Tapley (more about the Tapleys later) of Wartaka Station at Woodward Park. In 1888 Horace and Hannah and 3 children moved to Wartaka Station for about a year but life was hard and they moved back to Lake Wangary, living at Ulina at Warrow from 1908. Horace was a careful and conscientious farmer, a keen cricketer and fisherman and could be kind to those in need. Hannah and Horace had 8 children, Ella, Harry, Reginald, Annie, Gladys, Ivy, Ruth and Thelma, 2 sons and 6 daughters. Upon retirement, when the property passed to the 2 sons, Hannah and Horace moved to Coulta township. Horace died 6-8-1940, the last surviving member of John St George and Sarah Puckridge's family, and Hannah died in Feb, 1941. They are both buried in the new Coulta Cemetery (picture right). George Wartaka Tapley 1880 died at 3 months. Fred McEvoy, born 2-12-1880 at Wirrabara died 25-1-1962 Port Lincoln, was the first child of Joseph McEvoy and Eliza Case of Hammond. Joseph McEvoy was described as a contractor on the birth certificate. Fred grew up at Hammond where the family farmed, but it must have been a difficult life with continual droughts. 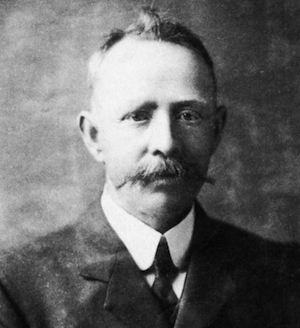 When the family trekked to Eyre Peninsula in 1903, Fred was already working on the West Coast for Mr Jim Cuddeford at Warrow. I remember Grandpa McEvoy as always looking very smart in a brown striped suit and waistcoat with a fob watch. He was balding, wore round glasses, was slim and of medium height. He wore a smart felt hat, as did all the men in those days, and had a rather long straight moustache. He loved euchre and would stay with my aunties Joan and Ellie (also euchre lovers) at Port Germein and walk over to see us at our beachfront house. Mum said that he was terrible (expletives removed) when it came to food and always complained about something, no matter what he was served, and she was a very good cook! Auntie Joan also had words with him quite often about the food. We kids all loved his visits, especially because when he left he would always hand us shillings and florins. In later life he would stay with each of his daughters for a few weeks to a few months at a time. Cousin Helene's most vivid memory of Granpa is of him chasing a very young Jackie Holland across the paddocks shouting and swearing at him for cheating at cards. The Fred McEvoy family took their cards very seriously indeed. Fred loved horse racing and bred and trained work horses and race horses, and may even have taken illegal bets at the Port Germein Hotel when he was in town. My dad followed in his footsteps with a love of horse racing after all his involvement with horses in his youth. Others particularly remember Fred's bent finger and his great way with horses. He was the local vet and Bryan Broad recalls him using sugar to help get seeds out of the cows' eyes. Born at Lake Wangary, to Horace and Hannah Puckridge on 13-5-1890, the fourth of eight children, Annie Edith Puckridge was known as Monnie after a pet lamb which she owned. She is described by her niece, Doreen McEvoy Kennewell, as a beautiful, gentle lady who took everything in her stride and always looked contented. She married Frederick McEvoy on 24-11-1908, when she was only 18, at home, Ulina Station, with her parents' reluctant approval. They were unhappy that their future son in law was not only ten years older but a Roman Catholic. Fred had been working in Warrow, which is 4.7 Km north of Coulta on the Flinders Highway, north west of Pt Lincoln, and had got to know the two Puckridge sons. When her parents refused permission for the marriage, Monnie is said to have taken to her bed and been so sick that the parents feared for her life. The young couple took up residence at Warrow in a cottage opposite the hotel. Two children were born during this time, in 1909 and 1911. Fred and Monnie moved to a share farming position in Sceales Bay near to his parents, Eliza and Joseph, who had trekked to Sceales Bay from Hammond in 1903 following a number of disastrous droughts in Hammond. Two more daughters were born at Sceales Bay in 1913 and 1915. The Port Lincoln to Thevenard railway was being built and land alongside it was becoming available. Fred went off to select property and chose Mt Jane at Cungena. The whole family moved there in 1916. A big government shed with tanks at either end had been built for them and their house was constructed of split pine and clay under this shed. It was here that the family lived and continued to grow to 10 children, 6 daughters and 4 sons. Monnie's life must have been a very hard one. She was frequently pregnant, isolated, struggling to make ends meet during droughts and recession with basic living conditions and minimal water, but she seems to have been a gracious, calm and happy person, very religious in her adopted Roman Catholic faith and renowned for her kindness and hospitality. The house was always made to look as clean and attractive as possible. Monnie wrote frequently to her parents but there does not seem to have been much contact with the Puckridge grandparents and Dad certainly never spoke of them. My mother remembers when she first met them that times were very hard. Some of the blankets were made from old wheat and chaff bags but very clean and nicely decorated and empty kerosene tins and boxes were used to make practical and useful furniture. There was always a nice garden around the farmhouse and they grew what vegetables they could. In later years Monnie suffered from diabetes and died aged 63 on March 13, 1954. Both Monnie and Fredbare buried at Streaky Bay Cemetery. The death occurred last Saturday of Mrs. Mona McEvoy, 63, of Cungena. Mrs. McEvoy had been suffering ill-health for the past year. Formerly Miss Mona Puckridge, of Lake Wangary, the late lady married Mr. Frederick Joseph McEvoy in 1909 . She lived practically all her married life on the farm at Cungena. Mrs. McEvoy was a quiet and gentle woman, much loved by the members of her family, and highly respected by all who knew her. Her kindly nature won her many friends who, along with her family, will deeply mourn her passing. After a short service in St. Canute's church on Monday morning, the cortege left for the Streaky Bay Cemetery at 9 o'clock. Rev. Father J. Dunne officiated. The large crowd of people at the graveside-from local and far districts-was a splendid last tribute. There were many beautiful flowers. Pallbearers were sons Norman, Frederick, Martin and Laurence, and sons-in-law Pat Holland and Norm Smart. All members of the family attended the funeral. You can see the family history of the McEvoys on my other McEvoy Family pages. Their fifth child and first son, Norman McEvoy, born 13-7-1918 at Cungena died 2-3-1980 Adelaide married Diana Kermode of Adelaide and they had 3 children, including me. Below is the direct line between those children and the most distant Puckridge that Mollie Puckridge researched in her books. Louise McEvoy ----- Peter Nordestgaard.